Do you have what it takes to empower children to take control of their own Learning? 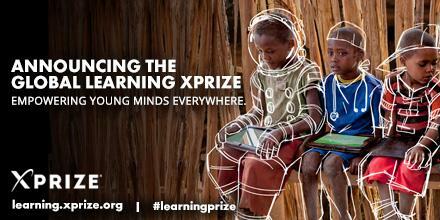 Enter the Global Learning XPRIZE, a $15 Million Global Competition. The Global Learning XPRIZE challenges teams from around the world to develop open source and scalable software that will enable children in developing countries to teach themselves basic reading, writing and arithmetic, empowering them to take control of their own learning and ultimately their future. Their goal is an empowered generation that will positively impact their communities, countries and the world. Five finalist: $1 million each will be awarded by the Judging Panel to teams with the best proposed solutions. Grand prize winner: $10 million will be awarded to the top performing team solution based on the field testing of the teams. The competition is open to competitors globally of any age with a range of skill sets. Both individuals and teams are eligible to register. Each person or team wishing to enter must complete an Intent to Compete form. Team participants, vendors, and other interested parties may complete an Intent to Compete free of charge. Only teams that are successful in advancing completing each phase of registration will be invited to participate in the competition. See more eligibility criteria here. Ability to measurably increase the learning of children with limited access to schooling. Creation of a design that is easy to use and engaging for children, so they can operate it alone and/or in self-organized groups. Creation of open source software that makes marked improvements to existing technology. Judges will also assess the background research and quality of explanation of the design.